When our bestest chip buddies Awkward Terrible were in town last year for our fantastic show with Bit Shifter at the DNA lounge, we spent a couple days in the studio tracking four songs for what was originally planned as a split EP. What has evolved instead is a monster of a four-track collaborative EP, with all the members of each band playing on every song. 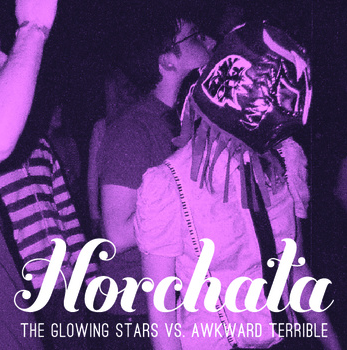 The new EP is called Horchata, and will be available on January 20th to the whole world. We can’t think of a better way to start the year than to share these new tunes with you, and we’re doing it in a big way. Awkward Terrible is coming to the SF bay yet again to share the stage. And when we say “share the stage”, we mean it. The show will feature not only sets from both bands, but a combined set with all four of us onstage, playing all the material from Horchata live together. Chaos will ensue. Hearts will be broken. Worlds will crumble. See us play the show at The Blank Club in San Jose with our local chip favorite crashfaster on Wednesday, January 18th, where we’ll be selling advance copies of Horchata as download codes. Follow us on Facebook and Twitter for more information and updates about Horchata.